1.12+ Version of ExNihilo, based on Adscensio. But that's not all. Creatio has his own rotational Power system for automating various parts which were a chore in previous versions of the mod. Like for example Automating your sieves! What is going to come in the future? Please provide feedback on balancing and suggest features. For questions and feedback, visit the Ex Nihilo Creatio Discord. Issues/suggestions should be submitted to the github issue page. Note versions >=0.3.3 require ShadowFacts' Forgelin. There's anyway to make a custom transform in Witchwater? I would like to make blazes transform in one of the thermal blazes (blitz, blizz or basalz) when they touch Witchwater. There is not currently a way to do that. Though there are dolls for the thermal mobs. I noticed that all of the vanilla seeds have the "seed" ore dictionary tag. Cooked meat also has "listAllCookedMeat." Is this a Forge thing, or is it added by Ex Nihilo Creatio? I ask because there are quite a few modded meat and seeds that don't follow this convention. I don't know if I should be opening issues with this mod or the other ones. Ex Nihilo Creatio adds some oredicts (see code). Ex Nihilo adds "listAllmeatcooked" and "listAllseed" to vanilla items. This can be disabled in the configs. I don't know what mod is adding "seed" as an oredict. Ex Nihilo Creatio is basically aping Pam's Harvestcraft's oredicts (Pam's will also add the same oredicts as Ex Nihilo Creatio). You can add/remove oredict entries to items using CraftTweaker. It's not really an issue with any mod since there is no established convention anywhere. Hello! This mod is awesome! I do have a question though, how do we make witch water? JEI isn't bringing up the recipe. By default it is to put water in a barrel sitting on mycelium, but if JEI does not bring the recipe up your mod pack may have changed it (be sure you are clicking on the bucket of witchwater not the witchwater square "block"). There's anyway to disable exnihilo ingots if other mods already exist? E.g. in my pack Thermal is present and I have copper, tin, lead, silver and nikel dusts and ingots twice. The newest version (0.4) should be smarter about figuring out if ingots already exist; you can also specify the ingots that should be used in the OreRegistry.json config file. Currently I don't think there is a way to force disable the dust. 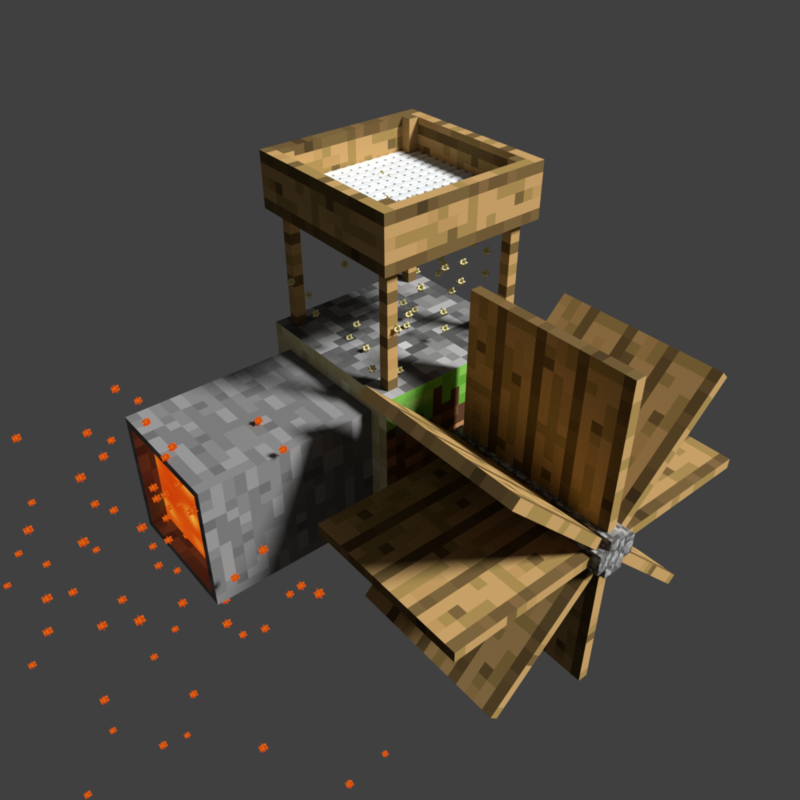 Version 0.4.1 will treat dusts like ingots; but it may be a while before it gets released. I don't know what a hamham is, it isn't from this mod. You just make a hammer and break blocks with it. Project Ozone 3 added the compressed recipes, it is a custom configuration they have, and if you are playing PO3 it should just work™. You can add it to the JSON configs if you aren't playing PO3. The sieve registry randomly breaks when I boot up MC. I made heavy edits to the registry so I figure maybe that's the issue. It goes from listing all blocks to listing some of them or just plain none at all. I don't know what to do here. I tried trimming the registry down and I thought it worked but it keeps ignoring parts of the registry. And I know my edits work because when they do load, everything I put in works fine. If you aren't on 0.3.9 update and see if that fixes it. If you are on the latest version post a bug report to the issues page and list what mods you have installed, the contents of the logs/exnihilocreatio/<most recent> and a pastebin link to your json file. 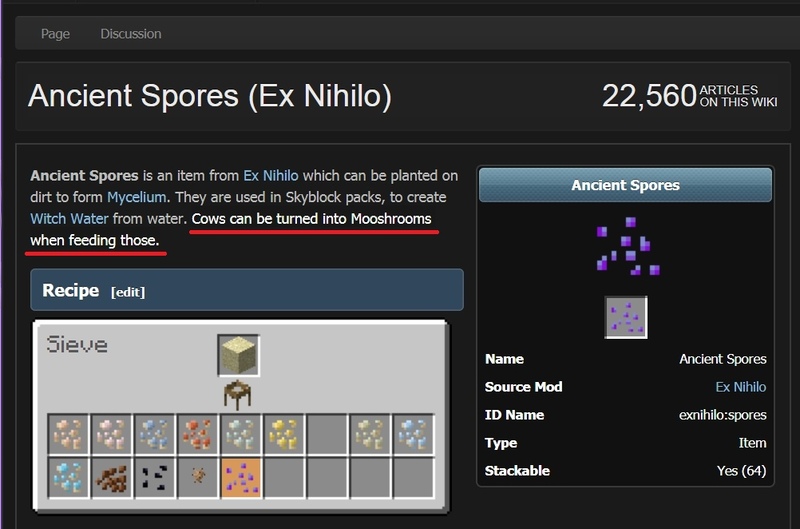 Please, add ability transform cow to mushroom cow by feed them ancient seeds, like it was at earlier version of ex nihilo. Because get mushrooms in factory sky map besides how get it in hell must not. Normally suggestions should be submitted to the github page as an "Issue" (see the "Issues" link at the top of the page). I can add it, but this isn't the version of Ex Nihilo used in any released SkyFactory packs; the latest released SkyFactory is on 1.10 and uses Ex Nihilo Adscensio.